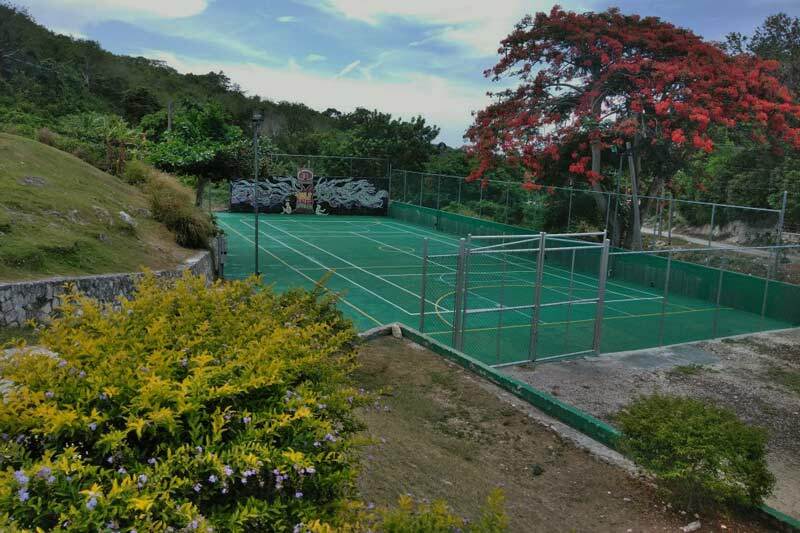 At the SOS Children’s Village Barrett Town in Montego Bay, Jamaica, tennis is a way of life. But until recently, the tennis court at the Village was in such poor condition that it was unsafe for children and youth to play there. Thanks to the generous support of Transat A.T. Inc., the tennis court has been refurbished so SOS children and youth from the surrounding community can once again play the game they love. At 4:00 p.m., the SOS children and youth have finished their homework and can now use the court. After eagerly waiting, Garfield, their SOS father, tells them they can go to play tennis. Garfield himself walks down and plays tennis with the children. They take turns playing doubles and singles until the sky turns dark. If it were up to the kids, they would play until dawn, but Garfield tells them it is time to go back home. Matt*, 17, plays every chance he gets. He says he loves tennis because it is a good sport. He starts school at 10:00 a.m. so he gets up early to play tennis with other SOS youth. He plays again later in the day when his younger siblings arrive home from school. “We have noticed a direct improvement in their grades since they started playing tennis regularly. It gives them discipline and motivation,” says Tanesha Anglin, a social worker at the SOS Children’s Village Barrett Town. The goal of the court is to offer children and youth the opportunity to be active and healthy. Tennis helps to channel their energy, gives them discipline and cultivates other benefits like emotional balance, improvements in concentration, and better learning capacity. “The results have been so positive, especially academically, in their behaviour and with their emotional health too,” says Nadine Williams, National Director for SOS Children’s Villages Jamaica. The court is also open to the wider community, giving disadvantaged children and youth living near the Village the chance to play and benefit from the newly repaired court. The children, youth and staff at SOS Children’s Village Barrett Town are grateful to Transat A.T. Inc. for repairing the court and giving them the opportunity to play and enjoy tennis. Sports are a great way to keep children active but as SOS Children’s Villages Barrett Town proves, they offer a number of benefits that go way beyond keeping children healthy. Many children and youth have gained physical and social benefits while also having fun. Canadians wishing to help children in need are encouraged to sponsor a child, sponsor a Village or make a one-time donation. Your support will help change the lives of orphaned, abandoned and other vulnerable children. Please help today. *Name changed to protect the privacy of the youth.